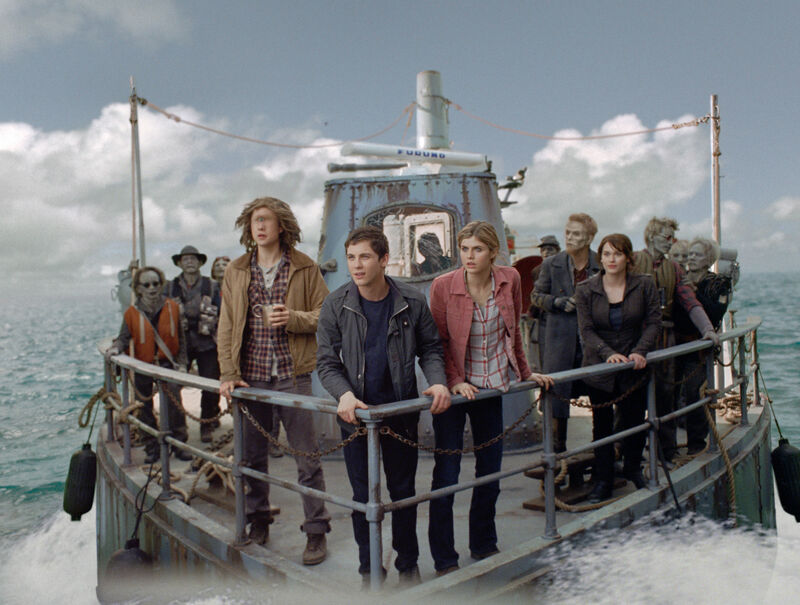 Percy Jackson: Sea of Monsters is a monster of a film in all senses of the word. Twentieth Century Fox’s latest instalment in what looks like it is fast becoming the next big franchise movie series, is a film which delivers action and noise aplenty, but perhaps at the cost of anything of real depth. Directed by (the appropriately named) Thor Freudenthal and starring Logan Lerman, Alexandra Daddario, and Brandon T. Jackson, this followup to the less than warmly received Percy Jackson & The Lightning Thief (2010), is pretty much more of the same. Percy Jackson (Lerman), the half-human son of the Greek god Poseidon, finds himself in trouble as he is once again faced with a deadly foe whom, unknown to him, is actually a relative. So, with the help of his friends Annabeth (Daddario) and Grover (Jackson) it is up to Percy to save himself, and the world, from a fate of mythical proportions. There is a fundamental problem within the field of modern cinema aimed at the older children’s (often referred to as ‘young adult’) market – namely Harry Potter. Since the initial 2001 outing in that cinematic juggernaut, everything which followed (including its numerous sequels) was justly or otherwise graded against that original. Studio’s were falling over themselves to discover their own pot of gold, hence Twentieth Century Fox latching onto author Rick Riordan’s bestselling Percy Jackson series. Placing Jackson in a town like environment called Camp Half-Blood, completely self-sufficient and removed from the outside world, is hardly subtle. Furthermore having this magical place peopled by an array of characters half human and in this case half god (the source of any required magical powers), as well as the obligatory smattering of centaurs and fauns, and the similarities between Jackson and Potter are blatant to anyone with even a passing acquaintance with J. K. Rowling’s creation. As a result, apart from the clever inclusion of several creatures from Greek myth updated for modern consumption – such as the three Graeae witch sisters who share one eye – the adventures of Jackson as he battles an ancient evil intent on destroying him, his friends and the world as a whole, could be a further adventure of Rowling’s young wizard in all but name. Percy Jackson: Sea of Monsters may be a diverting and impressively visualised celluloid adventure but, as pointed out earlier, this is an example of spectacle over substance. However, as depth is unlikely to be what this film’s core demographic is looking for, that minor shortcoming is unlikely to be of great concern, and as a result the end product proves reasonable, if short-lived, fun.